We attended the third annual Zinc Shower event of ‘the creative and collaborative economy’ during May. The event attracts thousands of people to Madrid to discuss creativity, entrepreneurship, trends and technology. We were having a grand old time: bit of networking, chatting about Crowdcrafting and PyBossa and of course enjoying a few wee drinkies. We got the shock of lives however when they announced that Crowdcrafting had won the award for ‘Best Startup’. There was only thing we could do… more drinkies! 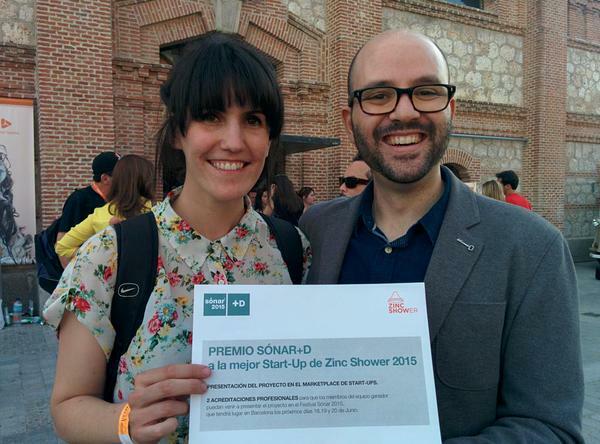 Photo by Daniel Lombraña González Daniel and Clara proudly display Crowdcrafting's award for best start-up. But it got better… there was a prize. Which was to attend Sónar festival and present Scifabric’s work. Shazam. Sónar is a festival of music, creativity and technology celebrated in Barcelona. It boasts to be at the cutting edge of the electronic music landscape and to be a meeting place for creative people from different disciplines and communities. This year’s headliners include the Chemical Brothers, Skrillex, Duran Duran, and now you can check out Crowdcrafting too. The festival has two limbs: Sónar by Night for music and Sónar+D, which aims to facilitate and improve the relationship between creativity, technology, innovation and business in an organic setting geared towards new creative and professional profiles. Attendees of Sónar+D partake in a variety of activities including development sessions, and have opportunities to exchange ideas and tools, as well as to secure financing. So ‘what on Earth can we present to a bunch of half-sloshed festival goers?’, we pondered. We wanted to present something geeky but relevant, so we created a brand new project in Crowdcrafting called Jamendo. The project aims to establish how music makes us feel. Our last blog post detailed how Crowdcrafting can be used to analyse sound data, and we used this capability to construct Jamendo. Here’s what you do… listen to a song and decide how it makes you feel – excited, happy, sad, bored, calm or just plane indifferent? Click on an emoticon that best represents your emotional reaction to the song, then move on to the next song. There are a dozen songs from a variety of genres to analyse. Easy peasy. We’ll be presenting our findings at Sónar. So if you’re attending the festival and are intrigued by whether hip hop makes people mad, classical has a calming effect, or pop makes you happy, then please swing by. We’ll also post our finding here for those not at Sonar. Until then… rock on Crafters!